Focus on the Family is slowly trickling out information on the next Adventures in Odyssey album. We have learned that album #58 will be titled The Ties That Bind. Just recently, the album artwork was also leaked by The AIO Update. We don't expect Volume 58 to release until later this year so for now we must be content with the little bits of information that are coming out about the upcoming album. 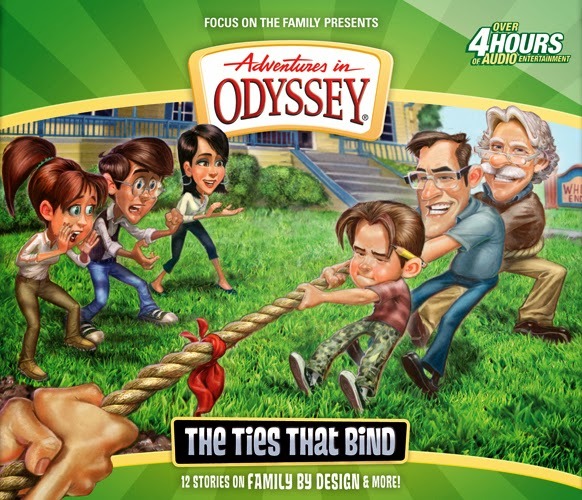 In addition to confirming that this is the official version of the artwork for The Ties That Bind, our source at Focus on the Family has also stated that there will be a few episode titles leaked over the next several weeks on the Official Adventures in Odyssey Podcast. They also disclosed that there will be some similarities between album 58 and 53. We know that is a bit vague, but it's enough to keep the speculation going. So speculate away in the comments below! What do you think about the artwork for Volume 58?